The top trash industry player is well-positioned to weather even its worst dreams. Halloween may be over, but it's never too late to check for scary situations that might befall your favorite stocks. 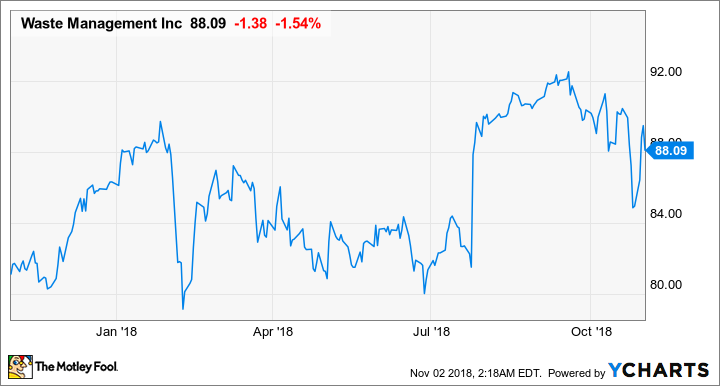 And on its recent Q3 2018 earnings call, Waste Management (NYSE:WM), North America's largest trash hauler and landfill operator, discussed plenty of possible haunts that could arise in 2019 to bedevil the company. Interestingly, though, many "nightmare scenarios" for other companies would be no big deal for Waste Management. After all, in a good economy, people will throw away trash. In a bad economy...people will still throw away trash. But here are three potentially problematic situations that could arise for Waste Management in 2019, and why the company looks poised to sail through them with ease. Scary situations can spook even top companies. Image source: Getty Images. Wait...isn't a strong labor market supposed to be a good thing? Well, generally speaking, yes. But when you're trying to attract people to an hourly wage job collecting stinky trash or cleaning up messy debris, a strong labor market isn't exactly working in your favor, because you'll have to pay more to attract those employees and keep them from leaving for less... shall we say... "aromatic" careers. In fact, 2018's strong labor market -- in which the unemployment rate dropped from 4.1% in January to 3.7% in September -- has posed challenges for Waste Management. The company ended up not only giving a $2,000 bonus to its hourly employees, but its overall labor costs increased by about 4% year over year in Q3 (excluding the $2,000). If the labor market tightens even further in 2019, Waste Management's costs may increase still further. The company still hasn't made a decision about whether it will have to offer a similar (or higher) bonus in 2019. But the good news for the company is that the $2,000 bonus only ended up costing about $70 million, with another $65 million in extraordinary compensation increases -- that is, increases above and beyond the "normal" merit-based increases ordinarily offered by the company. This $135 million was more than offset by the $236 million in tax savings the company has registered to date in 2018, not to mention overall improvements in pricing and operational efficiency. On the earnings call, CEO Jim Fish downplayed the potential impact of a tight labor market, but admitted, "[W]hen you look at the operating cost piece -- that $135 million over and above our annual merit increase -- we will look at that bucket and say, 'How much of that are we going to spend? How much do we need to spend to remain competitive in the marketplace from a labor standpoint?'" Even with a tight labor market in the mix, though, Fish was confident: "I think EBITDA growth can at least -- at a baseline -- be as good as this year, which is 5%. And there's a real possibility that we could exceed it in 2019." [O]ur business is quite a bit different than it was in 2008/2009. We had ten years ago a lot more exposure to the residential housing market. Today, our exposure to the residential housing market we think is kind of in the $100 million to $150 million per year in revenue range. And so, let's say, housing... dropped off the table and was down by 20% -- which, by the way, it's still growing today; it's just growing at a slowing rate. So this certainly doesn't feel like a 2008/ 2009, but let's say it was. Let's say it dropped off by...20%. Our exposure there, because we're a small participant in the residential housing market, is probably $20 million a year. So it's pretty small. We're much bigger when it comes to construction and demolition in the commercial and industrial sector. But there's been no similar sign of a slowdown in the commercial and industrial sectors. In fact, as COO Jim Trevathan pointed out on the call, the commercial line is the company's most profitable line of business in terms of margins and return on invested capital. So Waste Management doesn't have much to fear even in the event of a major housing market downturn. So far in 2018, the company's recycling revenues have accounted for about 11.7% of overall company revenue. But recycling commodity prices have collapsed, severely cutting into earnings from that segment. That's a huge headache for the company. The good news here is that this nightmare scenario has already happened. Waste Management's recycling revenue is down 22.5% year over year from the first nine months of 2017 to the first nine months of 2018, and recycling commodities are already near decade-low prices. Management believes that we've probably hit the low point of the recycling business. But even if management is incorrect, there's a plan in place to help offset the impact of a stagnant recycling business. When the problems with recycling came into focus, Waste Management started introducing new fees into its renewing recycling contracts. The first, a "recycled materials offset fee," helps to offset the low commodity prices. The second is a "contamination fee" based on the amount of nonrecyclables that are put into recycling bins, which has been a growing issue for Waste Management. According to Fish on the earnings call, very few of the company's customers were being charged these fees in Q1 2018. The company has ramped up the addition of those fees to its contracts in Q3 and Q4, and into 2019. Thanks in large part to these fees, Fish now expects recycling to generate potential tailwinds of up to $50 million in 2019, assuming recycling commodity prices remain flat. But if prices fall further, it's good to know there's a cushion there in the form of new fees that can absorb some of the losses. Unexpected situations can arise for any company, and certainly Waste Management could encounter some surprises in 2019 that it wouldn't be able to handle so easily. But even if a strong labor market, a weak housing market, and a further collapse in recycling commodity prices all occurred at the same time, the impact on Waste Management's bottom line would likely be minimal, and would likely be offset by strength elsewhere in the company. Investors should feel safe putting their money in Waste Management.